Hawaii's Big Island is very appropriately named - it really is very big indeed. 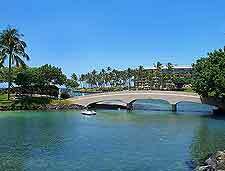 So large in fact that it will take you more than two hours to drive from the eastern city of Hilo, to the westerly beach resort of Kailua-Kona. The Big Island is considerably larger than all of the other main islands of Hawaii put together - Kauai, Maui, Molokai and Oahu, all of which lie to the north. Being so expansive means that the landscape of the Big Island is extremely diverse, with sandy beaches and deserts, steaming volcanoes and huge craters, tropical rain forests, and even some towering mountain peaks capped in snow. Kailua is one of the most significant towns and is located on the island's sunny Kona coast, while Hilo is the lush capital and home to the Hawaii Tourism Office (Visitors Bureau), which resides on Keawe Street and dispenses a variety of useful tourist information, including a very popular walking tour brochure. Accommodation on the Big Island tends to be at its busiest between December and April, which marks the peak season. Many of the most desirable resorts stand close to the beachfront and come with balconies boasting views of the Pacific Ocean. Resorts are plentiful around South Kona and Kealakekua Bay in particular, while the Kolea at Waikoloa Beach Resort is especially notable and well-placed for Hapuna Beach and Mauna Kea Beach. 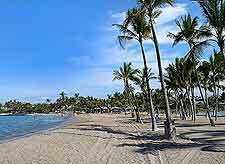 The Waikoloa Beach Resort stands on the north-westerly side of Hawaii island, next to Anaehoomalu Bay and Waiulua Bay, and comes with a selection of enticing golf courses, such as the Francis H I'i Brown Golf Club. 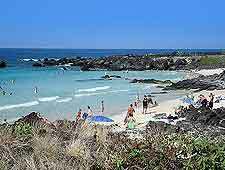 The vast selection of glorious sandy beaches is the main draw card for Hawaii and a number of exceptional beaches lie around the South Kona coast, particularly around the Kealakekua Bay State Historical Park, where the Captain Cook monument stands. Try to visit Big Island's Mahana Beach if at all possible, which owes its unusual green appearance to the high concentration of rare 'olivine' crystals, which were formed within ancient lava flows. To view the island at its very best, tourists should consider taking a helicopter tour, or enjoying a dolphin cruise or seasonal whale watching trip, all of which allow you to appreciate the coastline from a distance and different angle. 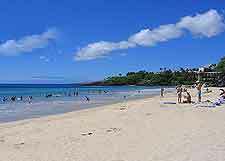 More information about Hawaii (Big Island) Tourist Attractions and Hawaii (Big Island) Beaches. The most beautiful landmarks on the Big Island tend to be those formed naturally, over literally thousands of years. These include the Akaka, Kahuna and Hiilawe Falls, three heavenly waterfalls which look like they belong in paradise. Also on Hawaii is the Mauna Kea Mountain, which when measured from its base on the floor of the ocean, is actually the world's tallest, with the summit containing a series of observatories. Another 'must see' to add to any Big Island holiday itinerary is the Hawaii Volcanoes National Park, where the Kilauea Volcano has been erupting virtually nonstop for over 25 years. 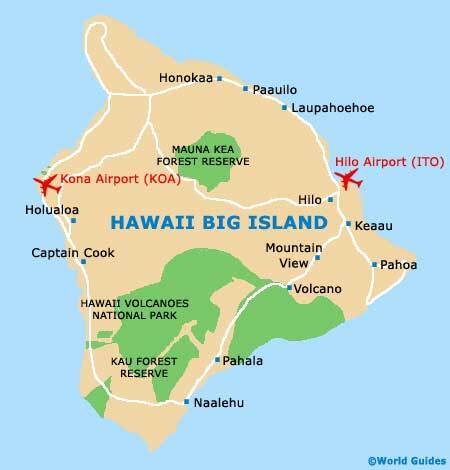 More information about Hawaii (Big Island) Landmarks and Monuments. Many different aspects of Hawaii's extensive heritage and culture are showed within its more than ample selection of museums, with information about the Big Island's past railroad, Kona coffee plantations and lava formations. Families will always enjoy a day out at the Onizuka Space Centre, or at the Parker Ranch Visitor Centre, where you will learner all about the history of Hawaiian cowboys (paniolos). The Hawaii Pacific Tsunami Museum is especially fascinating and documents the devastation that a huge tidal caused to the island in the middle of the last century. For art on the Big Island, check out the Wailoa Centre in Hilo, or the Pacific Fine Art Gallery in Kailua-Kona, amongst others. More information about Hawaii (Big Island) Museums and Hawaii (The Big Island) Art Galleries. The Big island is the most southerly of all the main islands of Hawaii and well connected by both sea and air. To the north, Maui is relatively close by and a very popular holiday destination in its own right, with magnificent sweeping crescents of sand, and some stunning natural structures, such as the tower rock pinnacle known as the Hawaii Iao Needle, and the Haleakala Crater at the summit of a giant volcano. Island hoppers may also want to head further north from the Big Island, visiting the sights and resorts on Lanai, Molokai, and also Oahu, where surfers flock to Honolulu and Waikiki Beach each year, and tourists gather in large numbers each November, when the World Hula Festival takes place here, at the open-air Waikiki Shell Theatre. 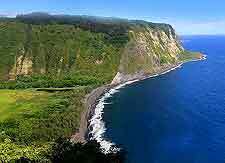 More information about Hawaii (Big Island) Attractions Nearby.